We are approaching the halfway mark on the beer advent calendar. There has been only one of the 8 beers I’ve tried already that I have not liked, which is fantastic. The excitement for each beer also has not diminished. I’m always very excited to see what the next style and region the beer will be from! Today’s beer comes to us from Mexico! Cerveceria de Baja California, to be exact. This brewery, founded in 2002, is located in the City of Mexicali. They are one of the few Mexican microbrews and produce beer under the label Cucapá Beer. The name for the beer comes from one of the tribes that live in the Mexicali Valley. The Cucapá tribe were the first settlers in the region. Their love for water and nature led them to live in the Colorado River Delta. The tradition of nature, the water of the river, the geographical location and the initiative of being the first people to explore the region is what makes Cerveza Cucapá as unique as the Cucapá tribe's ancestors. Mexico had been predominately made up of Macro breweries which left an opening for a gourmet microbrewery. Seeing this, the founders of Cerveceria de Baja California opened their doors as a brewpub initially in 2002. By 2004 their popularity had grown and they began considering how they might be able to expand. In 2007 they had expanded their production and bottling to be able to sell their beer to a wider market. They brew beers ranging from Blonde Ales all the way up to Barley Wines. 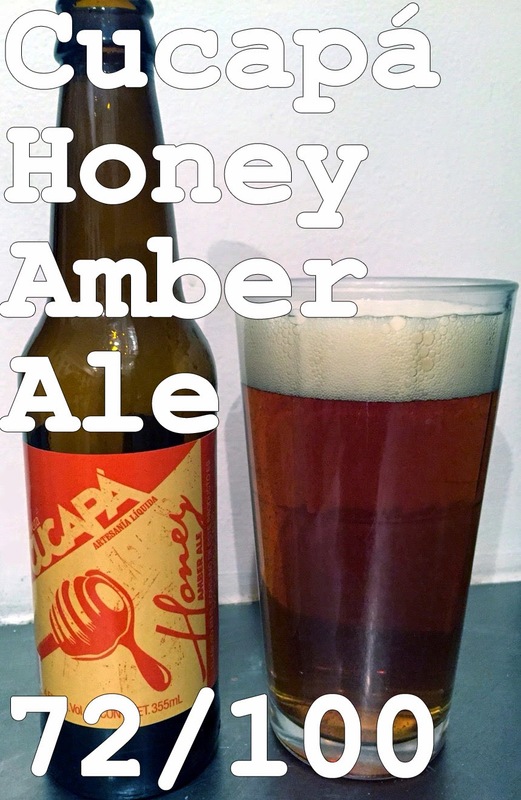 Today, we have the opportunity to try their Honey Amber Ale. Amber Ales are a name given to a Pale Ale that has been brewed using a proportion of amber malt and sometimes crystal malt. This produces an amber colour that ranges from light copper to light brown. Again we see how simple changes in the brewing process can lead to different styles and flavours of beer. Despite there being no real difference in the style from pale ale other than the malt choice, it is still a unique style with its own unique flavours. This particular beer, however, has honey that has been added during the brewing process, often in place of dextrose or another sugar, which gives it a wider flavour profile. This is the second North American beer in the kit. Onto the beer! Appearance: Clear, light brown with good amount of head. Retains well. Smell: Honey is very apparent along with the smell of apple and pear. Taste: Starts off bitter and then melds into a honey sweetness. Balance is off as the bitterness tends to linger longer than it should. Honey flavour is not as apparent as you would expect from a honey amber ale. Mouth feel: Coarse mouth feel, medium body, excellent carbonation. Overall: The honey flavour is there but this beer lacks balance. The bitter notes are not outweighed by the sweetness of the malt. The bitterness is almost metallic leading me to believe it is not from the hops themselves. Do I like it: I do not like this beer. It wasn’t terrible but it was not something that I would seek out and purchase. By happenstance I was eating spicy food while drinking this beer. After the initial tasting with a clean palate and taking notes, I continued to try the beer with my food. I noted that after eating spicy food the balance of the beer was much better. The flavours melded better and the honey was more apparent. Given that I base my scores off clean palate tasting, this will not enter into the scoring. I felt it was important to note though for those who may try this beer. Thanks for following along. Appreciate it!